How many hours do you spend sitting at your desk on the phone or on the computer? With new technologies, our computers have become our digital world, but we have stopped moving. Investing in a standing desk can help reduce the risk of back pain, heart disease, heart attack, obesity, diabetes, and more. The most common standing desk is an adjustable desk that lowers to a sitting position and to a standing position. Along with the desk, there is normally a stool with a backing that can also be adjusted. When in the standing position, its been reported that ones feet can get tired or that there is too much pressure on the feet, but this can easily be resolved by investing in good, supportive shoes or a foam pad normally used in kitchens to stand at the sink. Another great feature of the standing desk is that the screen can be adjusted to assure that the neck is in a comfortable position. 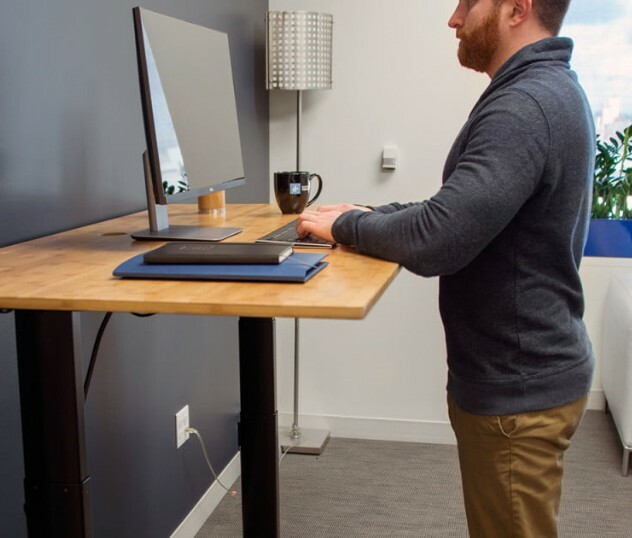 If you suffer from back or neck pain from too much sitting while working, talk to your human resource department and see if your company allows standing desks. We are able to give a note stating medical necessity if your employer requires this. If your office does not offer the standing desk, here are some other options. Lumbar supports can be purchased to help support the lower back and help sustain better posture when seated. There are many different types of supports some which can be more shallow or deeper than others. These can also be used in cars when driving to help with a long commute in traffic. 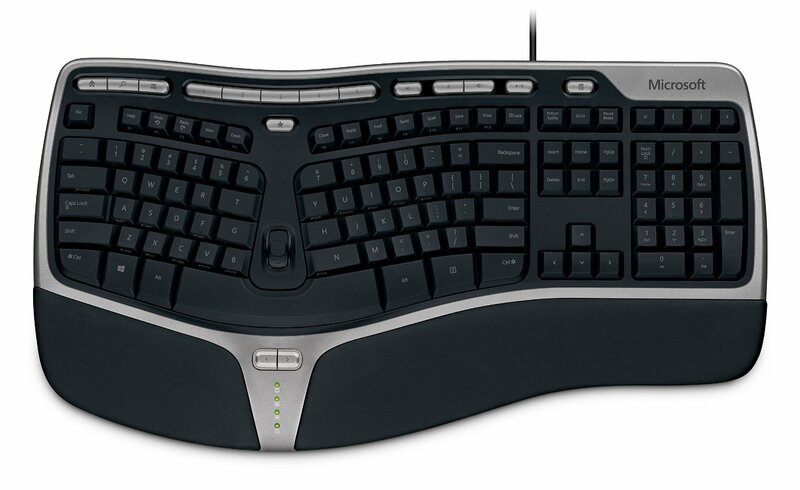 Another helpful tool at your desk would be an ergonomic key board that has supportive pads to support your wrists when typing. There are also mouse pads with a raised and padded area that supports your wrist. Staying active in the work place is also a great idea. We recommend taking advantage of work gyms to stay active during the day. If your work place does not have a gym or recreation center, try walking around the office during a lunch break whether it’s inside or outside the office building. It is definitely recommended that one gets up from their desk every 45 minutes to stretch and walk around to aid circulation. Work stations are critical for daily productivity. Keeping cool water within reach is a definite must. It’s not a bad idea to keep a healthy snacks available. Keeping a clean work station is also a plus. Making sure to keep everything you use regularly near by so you don’t have to reach over every time you need a stapler. Many office jobs require making phone calls that can last hours, but holding the phone up to our head is not always the most comfortable thing to do. Investing in a Bluetooth headset can be very beneficial in the work place and also on car rides home or to the office. A comfortable work place is beneficial to both employees and employers. If your work station is not designed for comfort and ergonomically sound it can hinder performance. Time missed from work due to aches and pain can be lessened if not eliminated. Just a few simple modifications is all it takes to keep everyone happy and feeling good. In addition to these modifications we would suggest seeing your chiropractor regularly to keep your spine in good alignment. Emergencies happen, but can they be avoided. Most of the time YES. We often receive calls from patients that are in severe pain from just doing their daily tasks. Bending over to empty the trash can, lifting a large suitcase into the back of their car, just sitting down into their car seat, getting out of bed and twisting wrong or taking their dog on a walk and the pup is pulling on the leash. These are real injuries that cause real pain but they don’t have to. If people would just think of chiropractic care proactively. When we receive these calls we do our best to see you as soon as possible. We know you’re in pain and getting quick relief is most important at that moment. Our schedule usually allows us to accommodate your needs. Usually these injuries happen to those patients we don’t see regularly. Regular (usually quarterly) chiropractic adjustments helps your body move the way you need it to. Correct spinal alignment prevent nerve interference. In addition, every system in our body works optimally when the nervous system is correctly functioning. When the spine is misaligned the slightest movement can cause pain and interfere with your activities. We can’t emphasize enough that it is to your benefit to see us before you are having pain. Pain can be avoided when you receive chiropractic adjustments to keep your spinal alignment instead of coming to us in pain to “fix” your spine. If your last adjustment has been more than 4 months ago, why not give us a call for an appointment today. 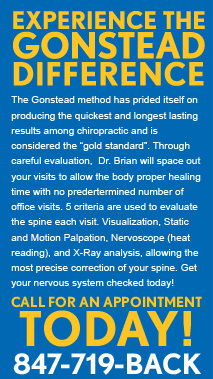 You and your spine will be happy you did and we will be very happy to see you. Don’t Pack Pain for your Summer Vacation! 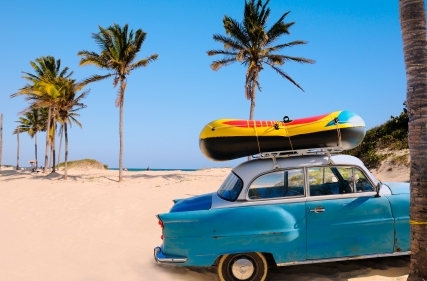 Are you traveling this summer? 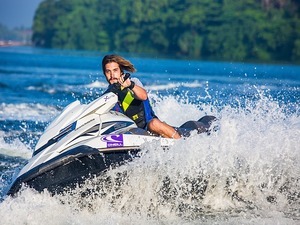 Whether you are taking a plane to a tropical island, driving to the coast, riding your bike in the mountains or doing extreme water sports on the lake, we want you to be safe this summer while still having fun. Sitting for long periods of time in the same cramped position while traveling to your destination, sleeping in unfamiliar beds and sleeping without the same supportive pillows, dehydration and the stress of travel and time zones on the nervous system can all take their toll on our bodies. There is definitely no space for pain when flying to your destination. Dr. Brian recommends to bring a towel with you on your flight. Roll it up and put it in your seat for a lumbar support while flying. Also carry a large zip lock bag incase you need to ice any sore areas while traveling. Turbulence shock and the vibration we experience while taking a plane may also cause a change to the structure of the spine and may lead to stiffness and discomfort and left untreated could cause a disc bulge and nerve compression. Stay well hydrated and move around regularly during the flight. We also suggest keeping the weight in your suitcase to a minimum. Don’t be tempted to over fill your suitcase and choose appropriate luggage with wheels or padded and supportive straps. Keep your back straight, use your core strength, bend from the knees when lifting your suitcase from the carousel and also loading it into taxis and cars. Healthy food choices, minimal alcohol consumption and adequate sleep while on vacation also help to keep you feeling and functioning at your optimum. After all the reason we take vacations is to rest and recuperate from life’s stressors. Have fun but remember moderation in everything is best. If you are traveling with a child, ask the airline for their policy on child car seat safety. Car seats for infants and toddlers provide added resistance to turbulent skies and are safer than the lap of a parent in the event of an unfortunate accident. A quick trip to your chiropractor before you fly to help optimize function and prevent any potential injuries is also a great idea. If you suffer back or neck pain, car road trips can be torture. Some of the main factors contributing to car rides being catastrophic on a “bad back” are as follows: poorly manufactured seats, chronic contraction of leg and back muscles (pedal management), and immobilization of the spine in the seated position. Be aware that pain from a long car ride often results after the ride is over. Issues can arise hours or even days later. Here are some helpful tips for those long car rides. LAPS: Pull over once an hour and walk or jog five laps around the vehicle. This can be completed in less than three minutes. If traveling with family or a competitive business colleague, make it a race! WALLET: Remove the wallet out of your back pocket. If a wallet remains constantly on one side of the body it can cause pelvic unleveling that can lead to, or aggravate lower back pain. LEANERS: People have a tendency to lean toward one side or the other while driving. This can wear your car seat unevenly and also create asymmetry and muscle imbalance in the spine and hips. Always sit evenly weighted on both your “sit bones”. 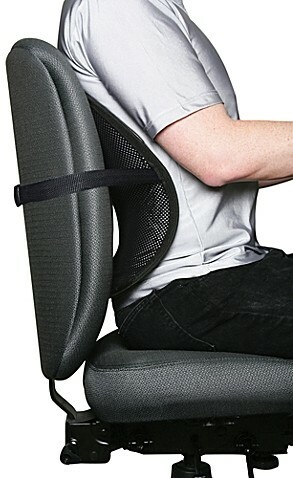 LUMBAR SUPPORT: Most people only set their adjustable lumbar support in their vehicle one time. Your back does not approve of staying in one position! Every 20 minutes change the support level significantly. It is essential to provide different positions for the lumbar spine so it is not immobilized while driving. Cyclists, even those not of Tour de France level, are susceptible to overuse injuries. Bikers tend to suffer from shoulder and neck pain from cycling. For the best experience on the trail, make sure to have the proper bike, most commonly used is a mountain bike with thick tires to absorb the shock and a bike with higher handle bars. The higher the handle bars the easier it is to keep your spine straight. Knowing the proper bike form is also key; your chest should be up, your arms should only support some of your weight – you shouldn’t hunch or expect your arms to carry a lot of the load. Get a shock absorbing seat or seat cover as well as covers for your handlebars. These little things will help to take stress off of your spine. You should aim for your muscles in your shoulders and neck to stay loose and periodically lower your head or raise it in order to help avoid injury. There’s no better way to beat the heat than extreme water sports, but it can also be one of the most dangerous parts of the summer. If you’ve never been whitewater rafting, you owe it to yourself to try it, but be warned: if you encounter whitewater (class 3-4 rapids), your body will take a beating. It’s fun, but the sudden chop can cause sprains in your neck, and possibly even whiplash. The best defense here is prevention, so don’t take on a more challenging course than you’re prepared for. If you do find yourself with a sore back or neck after the activity, use cold, not heat to help bring the swelling down. Visit your chiropractor, as putting it off or ignoring it can only worsen your condition. When water skiing, the most common injuries are to the ankles (although head and neck injuries can also occur), because they’re attached to the skis, and if you fall over, it’s going to inevitably stress your ankles, resulting in a strain or sprain. From a prevention standpoint, your best bet is to go slower on windy days with more chop, and be sure you’ve exercised to build up your leg and ankle strength before skiing. Again, going slower on windy days and not crossing boat waves will minimize your risk, but if you fall, especially if you suffer neck pain immediately after, don’t delay a visit to your chiropractor. Your chiropractor wants you to know that pain is not an unavoidable consequence of traveling. You can enjoy your vacation pain-free by seeing your chiropractor for assessments and preventative care and getting a spinal adjustment to keep you on the road, in the air, or on the trail. Remember, chiropractic care is well care – even if you don’t feel injured it doesn’t mean there’s not an underlying injury that needs chiropractic care. Enjoy your summer! What is it and how can chiropractic help? 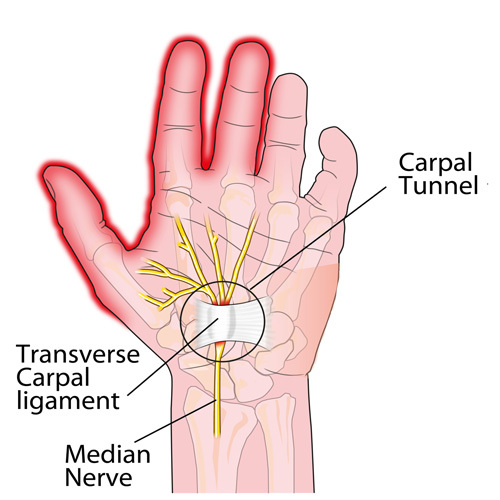 Carpal tunnel syndrome (CTS) is a medical condition due to compression of the median nerve as it travels through the wrist at the carpal tunnel. The neck is the cause of carpal tunnel “like” symptoms 80% of the time. CTS is a repetitive stress injury. The main symptoms are pain, numbness, and tingling, in the thumb, index finger, middle finger, and the thumb side of the ring fingers. Symptoms typically start gradually and are worse during the night. Pain may extend up the arm. Weak grip strength may occur and after a long period of time the muscles at the base of the thumb may waste away. In more than half of cases both sides are affected. When these symptoms are caused by a misalignment in the cervical vertebra, surgery is of no value. Having carpal tunnel surgery misses the cause of the symptoms. After this painful surgery and long rehabilitation time it is likely that the painful symptoms will return if misaligned vertebra go uncorrected. A study looked at the range of motion for 71 women with carpal tunnel syndrome when they moved their necks. When the data was compared to the range of motion in the neck for women without carpal syndrome, it was found that women with carpal syndrome had significant limitations and restrictions to their neck movement. In fact, the more severe the pain in the arms and wrist were from carpal tunnel syndrome, the more restricted was the motion of the neck when it was flexed towards the side of the body most affected by carpal tunnel syndrome. For women with just moderate pain from carpal tunnel syndrome, bending the neck towards the side of the body experiencing carpal tunnel pain was much easier. If patients were steered toward chiropractic prior to deciding on surgery perhaps they could avoid surgery and rehabilitation. Chiropractic adjustments to the wrist can reshape the carpal tunnel which is impinging on the medial nerve in the hand and is beneficial for patients seeking noninvasive relief from this ailment that has become all too prevalent with the increased use of computers, cell phones etc. Carpal tunnel syndrome is caused by repetitive motion, such as typing, texting or completing repetitive motions with the hands like assembly line work. These actions may cause pain and injury over time. The elbow and shoulder can also be effected. Cubital tunnel syndrome, also known as ulnar neuropathy caused by increased pressure on the ulnar nerve, which passes close to the skin’s surface in the area of the elbow commonly known as the “funny bone.” You can develop cubital tunnel syndrome if you repeatedly lean your elbows on hard surfaces. Shoulder misalignments can also effect these condition. Typically, chiropractic care, for CTS is to address the problematic wrist and elbow, as well as adjustments of the upper spine. Misalignment in the spine does contribute to symptoms of CTS. Patients are advised to rest the affected arm, apply cold to reduce inflammation and perform recommended exercises. If you are experiencing marked weakness in your wrists and or hands your condition is more urgent. Stress also plays a factor in CTS so it is important to find ways to relax and reduce stress as much as possible. Chiropractors administer care for more than just relieving pain. The ultimate goal of the chiropractor is to help restore and maintain the body’s natural state of ideal health. Chiropractic care is health maintenance of the spinal column, discs and related nerves without drugs or surgery. It involves the art and science of adjusting misaligned joints of the body, especially of the spine, which reduces spinal nerve stress and therefore promotes health throughout the body. There are no known contraindications to chiropractic care throughout pregnancy. All chiropractors are trained to work with women who are pregnant. Investing in the fertility and pregnancy wellness of women who are pregnant or trying to conceive is a routine care for most chiropractors. Chiropractic care in pregnancy is vital to the normal physiological function of both the mother and baby throughout pregnancy and birth. More women and birth providers are discovering the many benefits associated with chiropractic care in pregnancy. The Webster Technique is a chiropractic adjustment to the sacral (tail bone) which helps the pelvis to open during pregnancy and most importantly during labor. This also relieves pelvic pain and painful walking which is common for pregnant women. Having an open pelvis and healthy nervous system helps the baby position itself correctly during pregnancy which will hopefully help the baby from becoming breech during the latter stage of pregnancy. Studies have shown that pregnant women who have chiropractic adjustments through out their pregnancies not only feel better and have less aches and pains, but their babies are likely to drop and present correctly which helps provide a quicker vaginal delivery. Sacral subluxation may contribute to difficult labor for the mother (i.e., dystocia), caused by inadequate uterine function, pelvic contractions, and baby mal-presentation. Correction of sacral subluxation may have a positive effect on all of these causes of dystocia. The nervous system is the master communication system to all the body systems including the reproductive system. Keeping the spine aligned helps the entire body work more effectively. It is important to keep your child in a rear facing car seat until they are at least 2-years-old or have reached the seats height and weight limits for the facing forward position (usually 36 inches and 30 to 35 pounds). The 5 point harness placement is very important for child safety. The clip across the chest should be brought up to armpit level. The straps should be snug holding baby into seat. 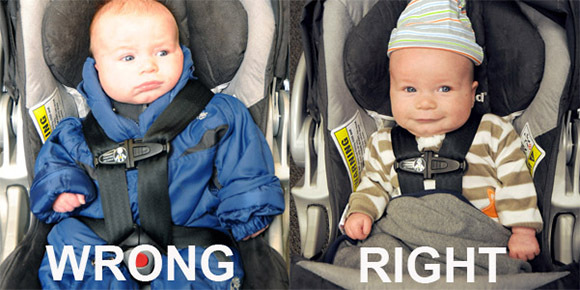 Do not have baby wear bulky clothing in winter coats will in their car seats. Crash tests have shown babies can be ejected from their heavy winter coats while properly strapped into their car seats. Use a heavy blanket to cover baby during winter months. Never allow an infant to sleep in their car seats after reaching your destination. If they are unable to hold their head up they should be in a reclined position while traveling. If they fall asleep you should avoid them slumping to head to chest position which could block their airway and in the worst case scenario cause suffocation. We also recommend putting additional padding in the lower back and seat areas of the car seat by adding a one inch thick foam pad which can be purchased at any craft store. Children’s car seats are not mandated to have padding in these areas which should be padded for your child’s comfort and protection. Child car seats are intended to keep our precious children safe if used properly. Having trouble securing your child’s seat in your car? Check with your local fire station or police departments. They are usually happy to help install these seats. 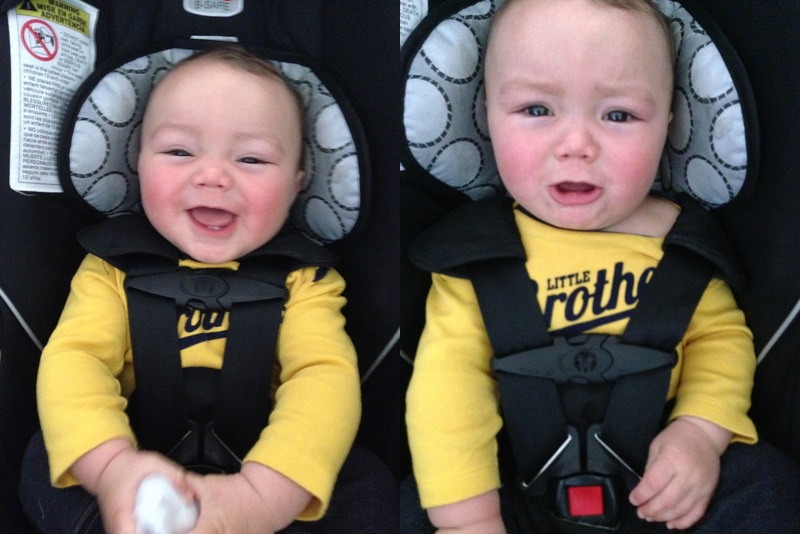 Changing diapers – There is a right and wrong way. 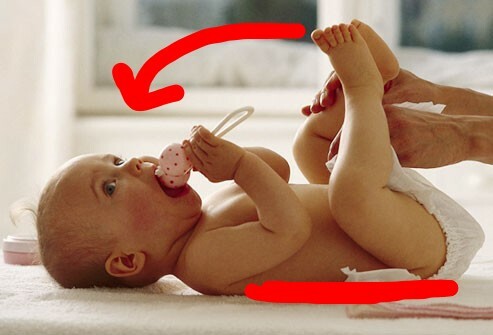 When babies are born their spines are in a C shape from neck to tail bone. As the baby develops and spends more time on their stomachs and learns to push themselves up they are developing their normal primary spinal curvatures in the neck and lower back. 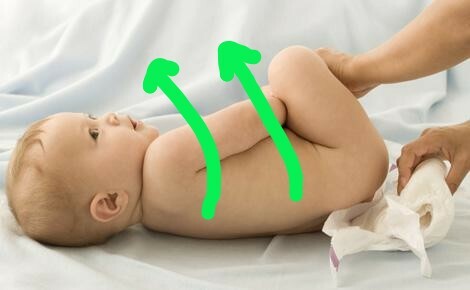 So if we are changing babies diapers in the typical way of lifting their buttocks up by holding their ankles we are actually stressing and potentially misaligning both the mid back and low back/tailbone area. This could cause digestive issues because the nerves from the thoracic spine (mid back) control the stomach, and lumbar spine and tailbone control bowel and bladder function. All those things can be affected because with every diaper change (which is a lot!) we are constantly putting stress on those areas of the spine, potentially prohibiting nerves from properly communicating with those organs which could cause digestive complaints in your baby (colic and constipation). The way to prevent these digestive issues and allow the primary spinal curves to develop like they are supposed to is to roll the baby to one side, clean them, remove the soiled diaper then slip the new diaper under them and roll them back onto the diaper and fasten. This method takes some practice and getting used to. We recommend starting early and continuing all the way to potty training. Once it becomes a habit it will be much easier. If you don’t have a newborn this method can be started at any age. Be patient as your child learns this new technique. Grand parents and some parents have difficulty getting up from the floor after playing with children at their level. Here are some tips to help when you find it’s a challenge to get up from the floor or ground. Bring the strong leg forward, knee bent, opposite hand on the floor for balance. Lift up, placing both hands on the front quad. Turn the back toes under and push your hands into the quad, using the strength of the thigh and upper body to push back to a standing position. Bring back foot in, stand tall and repeat as many times as you can. What Can An Adjustment Do For Your Heart? A spinal misalignment (vertebral subluxation) will always cause nerve interferences somewhere in the body. With the heart being the most important organ of the body, it is essential that we eliminate all interferences to the heart. Adjustments to the spine may lower blood pressure in individuals suffering from hypertension and provide an overall better heart rate for everyone. In a study conducted by the Department of Preventive Medicine at Rush University in 2007, realignment of the atlas vertebrae, also known as the C1 vertebrae of the cervical spine, can help to lower systolic blood pressure in people suffering from hypertension. Systolic blood pressure is the topmost number in a blood pressure reading. It’s the pressure felt along the arterial walls when the heart contracts. There appears to be a link between compression of the vertebral artery and an unhealthy elevation in blood pressure. By realigning the C1 vertebrae in the neck, restriction along the arterial wall is relieved and you may experience a decrease in blood pressure. The same principles apply to the effect that arterial compression within the spine could lead to an elevation in diastolic blood pressure. When the C1 is realigned, the compression is removed from the artery and thereby lowers diastolic blood pressure. When the cervical spine is placed in alignment, the nervous system is allowed to better communicate with the rest of the body. 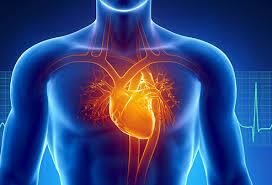 In relation to the heart, the improved communication can help bring your heart rate down to a healthy level. Liquids try to spread out and fill as large an area as gravity will allow it to. This is where blood pressure comes into play. Blood pressure (BP) is how hard your blood is pressing against the blood vessel walls. For people who have high blood pressure, the blood in their arteries is pushing up against these blood vessel walls too strongly. Your BP is measured in two numbers. The first number is the pressure while the heart beats and is pushing the blood through the body. The second number is the pressure while the heart takes a break between beating. The standard measure is around 120/80 mmHg. High blood pressure is also often known as hypertension. Some people use the terms interchangeably or to describe the highest level of blood pressure. This is when BP exceeds levels of 140/90 mmHg. The thing about very high blood pressure is it can also depend on the person. Some people just have naturally higher resting blood pressures than others. It’s important to have comparative tests in different situations. Oftentimes, getting your blood pressure tested at the doctor’s office is the worst thing to get an accurate reading on, since people are often quite stressed out while they are there. Often times called “the silent killer” but there are quite a few symptoms that suggest you have very high blood pressure. While these can also be symptoms of other things, when combined together, they paint a picture of what will give you warning signs. Fatigue – This can be both physical or mental. Those with high blood pressure may feel confused for no reason. Bloody Urine – This is certainly one of the most disturbing of the potential symptoms that you can have. Seeing it is very uncomfortable. Pounding Feeling in Chest – This is an uncomfortable feeling like you can feel your heart beating through your chest. Vision Issues – High blood pressure can often cause blurred vision. Testing your blood pressure should ideally be done at a normal time. It should be done when you are not feeling additional mental or physical stresses. There is no concrete singular reason that people get high blood pressure. There is a combination of factors that tends to cause it. People who smoke heavily often have high blood pressure. One of the main causes is often considered to be obesity or overweight. Going hand in hand with that is people who don’t get enough exercise. These two often tend to reinforce each other. Exercise – Being active is a great way to help manage things. Weight Loss – This can go hand in hand with exercise, but weight loss can also be independent of exercise. Diet – Eating healthy foods is always a good way to work on your blood pressure. It’s key to avoid processed foods whenever possible. Processed Sodium is Bad – High sodium levels can increase blood pressure, so lowering your processed sodium is a great way to stop it. Processed foods are often loaded with sodium to keep them preserved and packaged. Sometimes we just need a little salt, Dr. Brian recommends Grey Celtic Sea Salt. There are many misconceptions concerning salt. Sea salt has a host of health benefits and is far different from table salt. Sea salt is harvested naturally and is free of additives and preservatives. In addition, it contains a multitude of trace minerals and nutrients the body needs and often doesn’t receive from other sources. Using sea salt in moderation can benefit the skin, regulate blood sugar levels, improve cardiovascular health and ease sore muscles. It can also encourage healthy ph levels in the body and eliminate toxins. Sea salt also can be used externally to protect teeth and slough off dead skin cells. It is recommended to use natural sea salt that has been harvested in a way that does not involve processing. When you find out more about the benefits of sea salt, you will see that it is a far cry from table salt that you have been told to avoid. Reduce Alcohol – Another potential danger area is drinking too much alcohol. If can cause more blood pressure issues and thus needs to be limited appropriately. The best way to control high blood pressure is using natural methods. There are those who need medication, but if high blood pressure can be CURED through life style changes; such as proper diet, exercise and seeing your chiropractor to be sure your nervous system is functioning optimally. Isn’t that better than controlling BP with a medication, which does only that, and in most cases the medication needs to be increased or additional medication prescribed. Sciatica is caused by the sciatic nerve being compressed, Disorders known to cause sciatic nerve pain include lumbar spine subluxations (misaligned vertebra), herniated or bulging discs (caused by spinal misalignments that have been present for a long time), pregnancy and childbirth, tumors and non- spinal disorders such as diabetes, constipation or, sitting on one’s wallet in their back pocket.The most common cause of sciatica is a spinal misaglinment. Sciatic nerve compression may result in the loss of feeling (sensory loss), paralysis of a single limb or group of muscles (monoplegia), and insomnia. The purpose of chiropractic adjustment is to restore the body’s potential to heal itself. It is based on the scientific principal that restricted spinal movement leads to pain and reduced function and performance. Chiropractic care is non-invasive (surgical free) and drug- free. Adjustments At the core of chiropractic care are spinal adjustments. Hands on adjustment frees restricted movement of the spine and helps to restore misaligned vertebral bodies to their proper position in the spinal column. Spinal adjustment helps to reduce nerve irritability responsible for causing inflammation, muscle spasm, pain, and other symptoms related to sciatica. Adjustments should not be painful. Spinal adjustments are proven to be safe and effective. Ice/Cold therapy may also be recommended to help reduce inflammation and control sciatic pain. So if you or anyone you know suffers from the ailments listed above, a chiropractic adjustment could offer quick relief and get you back to feeling good and moving like you need to. As the new year dawns we are once again faced with new year resolutions. Do we make them, keep them, or just forget about them? These resolutions are made to improve ourselves and hopefully the quality of our lives. How many times do resolutions fall by the wayside soon after they are made? This year we would like to challenge ourselves. Instead of making resolutions that are difficult to keep, we should pick one area of our life we want to improve and do it well. Call it a lifestyle improvement instead of resolution. This is for us! We would suggest making chiropractic a healthy habit to keep all year long. Chiropractic brings sanity to health! Chiropractic takes your most important asset, your health, and gives you a perspective to better experience this thing called health and to maximize your experience while on earth. In 1918 BJ Palmer developed chiropractic and knew it could change the world. In 1918 there was the Spanish flu epidemic where many, many died. 1 in 10 of the worlds population died, most in the first 6 weeks of the epidemic. Roughly 20,000,000 people died world wide, 500,000 being Americans. Historical medical records show that in Davenport Iowa where chiropractic was founded at the same time in the same city 50 medical doctors treated 4,950 patients and 274 died. While 150 chiropractors and chiropractic students gave spinal adjustive care to 1,635 people and there was only 1 death. They concluded that patients had 140% chance of survival is they sought chiropractic treatment. One could argue and say that the reason there was such a high death rate with those treated by medical methods was because those patients were worse off. Oklahoma City solidified the findings when 136 patients diagnosed with the Spanish flu were told they were hopeless cases and should go home and get their affairs in order because death was imminent. 36 of them sought chiropractic care and 32 of them lived. Overall there were 950 deaths out of every 10,000 people who sought medical treatment verses 25 deaths out of every 10,000 people who received chiropractic care. This put chiropractic on the map. A quote from BJ Palmer “you have more faith in a spoonful of medicine than the Power that animates the living world”. It is important to understand the chiropractic philosophy. The key to chiropractic is not to just treat symptoms, which is why many seek chiropractic care. The key to chiropractic is to prevent ailments by keeping the spine in correct alignment which allows correct movement of the bones and the nerves to function uninhibited. Seeing a chiropractor only when you have back or neck pain is like buying an IPhone just for the calculator. Whatever your New Year resolution is we want to be part of your wellness plan for 2018. We will do our part by recommending when future appointments should be set and if not booked at the time of your last appointment we will call you when it is near the time doctor has recommended you return for your adjustment. We will also send postcards telling you it is time if we are unable to reach you by phone. Please call us at your earliest convenience to schedule your appointment when we leave you a message or when you receive a postcard. 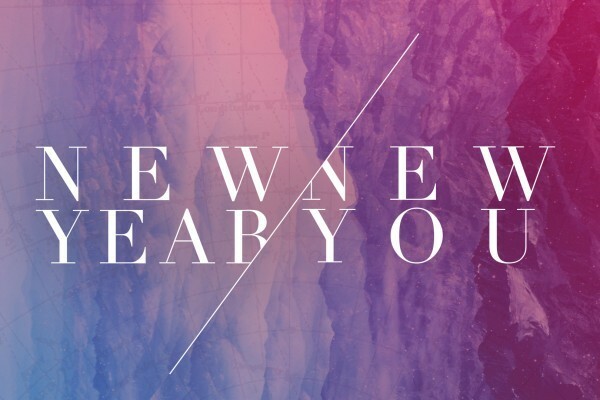 We are here to help and hope you have the best 2018! Herniated disc? Chiropractic can help! What if we told you, that you could avoid the surgeons knife to treat your herniated disc? What if treatment did not cost an arm, a leg or your spine. What if prolonged recovery from surgery could be avoided? What if you could avoid countless appointments with a physical therapist for weeks to several months which is required after the surgery? What if natural movement of your spine could be restored without painful surgery, and what if we told you it is possible to avoid all of the above by seeing your chiropractor? Chiropractic care is a nonsurgical treatment option for herniated discs. But what is a chiropractor’s approach to treating a herniated disc? Before we get to that, we need a quick review of what a herniated disc is. What Is a “Slipped” Disc? Is It the Same as a Herniated Disc? With the exception of the first 2 vertebrae in the neck—the atlas (C1) and the axis (C2)—there is an intervertebral disc between each of the 22 vertebra of the spine. Discs act as a shock absorber and a shock distributor, and provide flexibility. Imagine if you jump up and down. What would happen to the stack of bony vertebrae that make up the spine without the cushioning and support of these discs? Now, move your back from side to side. 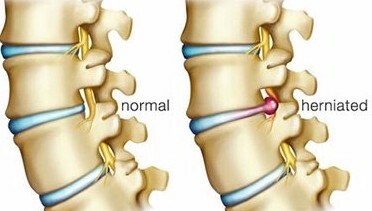 Again, you can visualize the give and take of the discs between the vertebrae. Without these discs, your spine couldn’t function. Intervertebral discs don’t really “slip”—although the phrase “slipped disc” has come into popular usage to refer to bulging, ruptured, or herniated discs. Throughout this article, we’ll refer to herniated discs, which is the more correct term. 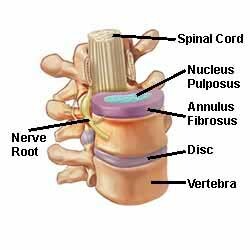 Your discs are made up of the annulus fibrosus (the tough outer layer) and the nucleus pulposus (which contains a soft, gelatin-like center). When cracks occur in the outer layer of the disc, the material inside of the disc can begin to push out. Numerous factors can cause a disc to herniate. For example, there may be too much stress on the disc due to poor posture or from being overweight. In fact. a heriated disc can be caused by a combination of factors or a physical injury. Chiropractors consider the body to be a roadmap of nerve pathways leading to and from the spine. The spine is the neurological super highway which transmits all the motor, sensory and autonomic functions to and from the brain. Chiropractors believe that the spinal bones must be in perfect alignment in order to enjoy optimal nerve function, and therefore health, throughout the body. Vertebrae are the bones which make up the spine and are subject to individual movement. When a vertebra is out of place, it is said to be subluxated. Vertebral subluxations are the focus of most chiropractic treatment. Chiropractors evaluate the entire spine. Even if you only have lower back pain, your chiropractor will examine your neck, too, for example. He or she wants to see how well your spine is functioning overall, and remember: What happens in one area of your spine can influence other parts of your spine and/or body. After reviewing this information, your chiropractor can determine if you have an intervertebral disc injury. The type of disc injury you have will determine what treatments your chiropractor will use to address your symptoms. When a known intervertebral herniation is being targeted, the Gonstead chiropractor will use specific adjustments to provide case-specific treatment. Chiropractors see surgical patients who present with back pain after having gone through surgery. Their disc may be partially or fully surgically removed and/or the vertebrae are fused together and the problem they originally had is still there because the vertebrae that caused the herniation is still misaligned. Many times this herniation in the neck is due to a lower misalignment that may be left unaddressed which caused a disc to herniate higher. It is important to address the whole spine to correct all misalignments that could be contributing factors. Most intervertebral disc injuries are related to a herniated disc, and your chiropractor can provide you with various treatment options to address your pain and other symptoms. To treat a herniated disc, your chiropractor will develop a treatment plan that will include spinal manipulation—also known as adjustments—and other chiropractic techniques to help ease your herniated disc symptoms. This will be an individualized treatment plan, but it may include manual therapy and therapeutic exercises. The specifics of what are in your treatment plan are particular to your pain, level of activity, overall health, and what your chiropractor thinks is best. As with any treatment option, don’t hesitate to ask questions about what chiropractic treatments are being recommended and why. We want to make sure you understand what will be done and how it can help relieve your pain. Chiropractic treatment is safe and effective for most patients. In addition to the spinal adjustment the chiropractor will also pump the disc This is a common chiropractic technique, which is used to help address herniated disc symptoms. This allows the chiropractor to isolate the affected area while slightly “flexing” the spine using a pumping action. There is usually no pain associated with this treatment. Instead, the gentle pumping to the painful area allows the center of the intervertebral disc (called the nucleus pulposus) to assume its central position in the disc. Flexion-distraction may also improve disc height. This technique can help move the disc away from the nerve, reducing inflammation of the nerve root, and eventually any associated pain and inflammation into the leg (if there is any related to your herniated disc).. Gradually, specific exercises and nutritional recommendations will be incorporated into your treatment plan. Your chiropractor will monitor you throughout the treatment plan. It’s a misconception that chiropractors “pop a disc back in place” using forceful adjustments. The “pop” sound comes from the release of gas under pressure within a joint. It is similar to the sound heard when opening a can of soda. Another misconception is that chiropractic care involves a few quick treatments, which can “fix” your disc. Instead, as explained above, chiropractors treat herniated discs using gentle low-force techniques. 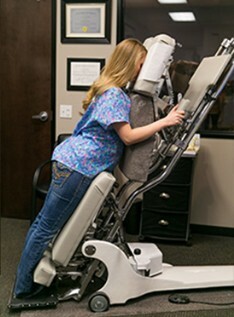 Your chiropractor will develop a treatment plan for your herniated disc, and if your symptoms do not improve with chiropractic care techniques, your chiropractor may recommend and comanage your condition with you being referred to a spine specialist. This will ensure you are getting the best treatment for your condition and speed your recovery. At Vanderbilt Family Chiropractic, we are thankful for so many things this Thanksgiving, especially for the chance to help the wonderful patients we treat each day. Thanksgiving is a time to eat good food and have fun with relatives. It can also be a time for stress, over-indulgence and stomach aches. Americans make a big deal over holiday meals, we make an even bigger deal over holiday eating. For some Americans, the worry of fitting into their jeans after the holiday season is a huge concern. Americans spent on average 2.3 billion dollars on Thanksgiving dinner foods. That’s a lot of food! Eat before you feast. Fasting throughout the day before your Thanksgiving meal can lead to overeating. Eating breakfast when you wake in the morning can curb your appetite, as can munching on crunchy vegetables throughout the day. If you’re having relatives over, encourage healthy snacking by making a vegetable platter with healthy dips for you and your guests to consume. Drink Water. Water is an appetite suppressant, so make the effort to drink lots of water throughout the day. Drinking ample water can prevent you from sneaking bites of pumpkin pie and ice cream as you prepare the meal. Pace yourself – It takes about 20 minutes for your stomach to tell your brain that you’re feeling full. In that time, many people overeat. Pacing yourself can help. Take pauses between bites. Draw out the meal by savoring your food, eating slowly, and smelling the delicious scent of each dish. Go for a walk. Going for a walk can encourage the digestive juices to start flowing after your Thanksgiving meal. Get together your guests after the meal is over and go for a walk around the neighborhood where you live. This will help you burn off some of the calories that you’ve just consumed and will also help you get over any stomach ache that you may feel when you’re done eating. Manage your stress – Many people feel stress at the holidays, especially when entertaining guests. Using stress management techniques can help you enjoy your meal and may prevent you from stress-eating. Take deep breaths throughout the day. If you feel your muscles tensing throughout the day, take deep breaths to loosen your muscles and settle your emotions. Give thanks. Put things into perspective by taking note of the things that make you feel thankful. Plan ahead. Disorganization can lead to stress. Planning ahead can help. Cook dishes ahead of time and clean the house the weekend before the event. Avoid bending directly over the oven door to lift out that heavy turkey. Crouch and use your legs and knees for better balance. This will avoid putting all the weight-bearing stress on the lower spine. Road trips – If you’re going for a long drive to visit friends and relatives this Thanksgiving, make sure to take a break from driving and get out of your vehicle to stretch. This helps restore normal posture and prevent recurrence of painful neck or low back conditions.When loading your vehicle for the trip or from the grocery store, organize your luggage, packages and goods into smaller loads, as opposed to carrying them all in one load. 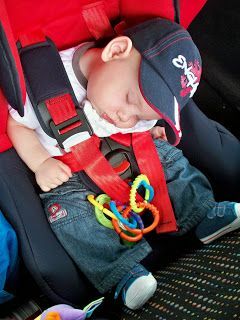 Adjust you car seat’s headrest, making sure that the top is no more than two inches below the top of the back your head. Make sure everyone is wearing seat belts . Most of the estimated 20 million victims of auto accidents in America suffer from whiplash, which can easily be prevented by properly adjusting the seat headrests. Use the correct car seat or booster seat for your children and make sure they have a head rest or a child-sized neck pillow so they don’t strain their necks falling asleep in the car. 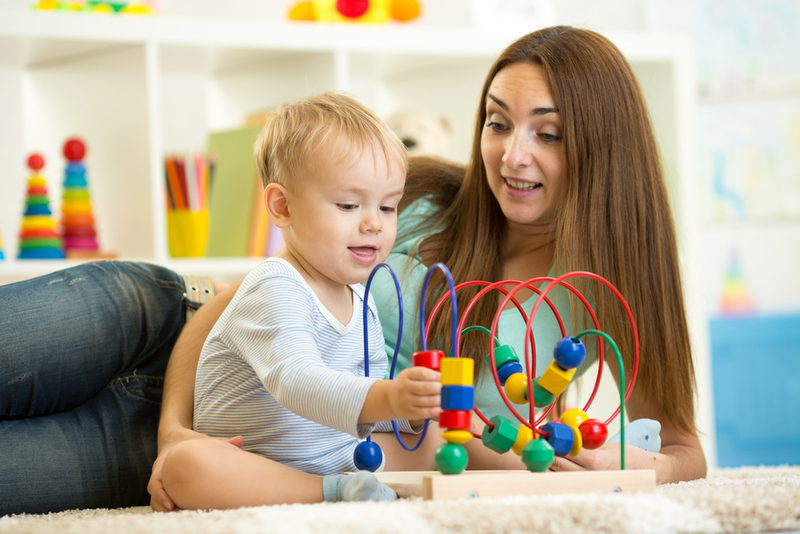 Without support, your child’s head can flop forward and sideways and affect their breathing and even cause misalignment of vertebrae. Practice proper posture when sitting, standing and shopping! With the long weekend, you’ll most likely spend time sitting and slouching on the couch or recliner. Try not to sleep in these position because the joints in this position may irritate the nerves and blood vessels and cause muscle spasm. See your Chiropractor – A well-timed chiropractic adjustment can help your Thanksgiving go more smoothly in a variety of ways. Chiropractic adjustments boost the immune system while preventing muscle pain and injury, so you can spend your Thanksgiving enjoying time with friends and relatives. In addition to chiropractic adjustments, a good chiropractor will use a variety of natural techniques to help you have a happier, healthier holiday. Stretches and exercises. Your chiropractor can teach you a variety of stretches and exercises that you can use to loosen your muscles, reduce stress and aid digestion after the meal is over. Lifestyle advice. Making small changes to your habits at the holidays can help you feel less anxiety while avoiding illness. Your chiropractor can give you lifestyle advice to help you make those changes. It would be a good idea to come in for an adjustment prior to the holiday season so that you and your spine can be in good shape for this busy season. With these few simple tips everyone can have a happy Thanksgiving. 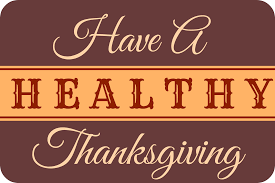 We wish you and yours a healthy, happy Thanksgiving. As we enter cold and flu season there are a few things we can do to boost our immunity. We recommend taking a good quality Vitamin D supplement. Dr. Brian recommends Bio-D-Mulsion Forte which is easy to take and has 100% bioavailability. We have Bio-D-Mulsion Forte for purchase in our office. In addition to Vitamin D a healthy diet rich in vegetables and fruits, exercising most days of the week and sufficient rest helps to keep us healthy. Of course chiropractic adjustments assure our spine is in good alignment and our nervous system is working optimally, which helps our immunity too. Even while taking all these precautions we may still get colds or flu. There are natural ways to help us lessen the severity of these conditions. One good way is to do nasal irrigation at the onset of symptoms. This is a gentle way of washing the sinus cavity of congestion. The easiest way to do this is to use a Netipot. 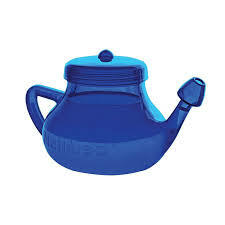 A netipot entails flushing out your nasal cavity with a saline solution. Benefits include improving or alleviating allergy symptoms, nasal/sinus congestion, runny nose, sinusitis/rhinitis infections, sinus headaches and reducing the frequency and durations of a cold or flu. A study of 211 patients from the University of California Nasal Dysfunction Clinic who had sinonasal disease (including allergic rhinitis, aging rhinitis, atrophic rhinitis, and postnasal drip) and 20 disease-free control subjects were enrolled. Patients irrigated their nasal cavities using saline solution twice daily for 3 to 6 weeks. Patients rated nasal disease-specific symptoms and completed a self-administered quality of well-being questionnaire before intervention and at follow-up. RESULTS: Patients who used nasal irrigation for the treatment of sinonasal disease experienced statistically significant improvements in 23 of the 30 nasal symptoms queried. Improvement was also measured in the global assessment of health status using the Quality of Well-Being scale. CONCLUSIONS: Nasal irrigation is effective in improving symptoms and the health status of patients with sinonasal disease. There are plenty of videos on Youtube to instruct you on how to use a netipot. It is important to clean your netipot before and after each use. Do not use tap water, it could have bacteria in it that shouldn’t be introduced to delicate sinus tissue. To be safe use only warm distilled or tap water that has been brought to a boil then cooled down. Be sure water is tepid, not too hot or cold. There are companies who make the salt powder in convenient one dose packets, but you can make your own too. You will need 1/2 tsp to 1 cup of water and 1/4 tsp baking soda is optional. Mix well before using. Nasal irrigation is easy and even though the first time may feel weird it is painless and helps thin and clear mucus and infection from the sinuses and nasal passages making you feel better sooner. It would not be a bad practice to do nasal irrigation even when feeling well as a prevention to keep viruses and bacteria flushed out before they have a chance to cause illnesses.